Tessa Price, LCPC, is a Licensed Clinical Professional Counselor. 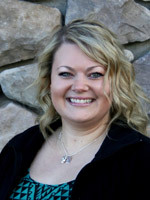 Tessa completed her undergraduate degree in Psychology at The College of Idaho in 2007 and completed her Master of Arts in Community Counseling at Gonzaga University in 2010. Tessa’s internships and graduate work focused on helping children, adolescents, and adults heal from and process past abuse in individual and group settings. Tessa has also worked with individuals and families seeking assistance with anxiety, depression, and behavior related diagnoses. Tessa hopes to help each of her client’s identify strengths, achieve individual goals, and find inner confidence. In her free time, Tessa enjoys Irish dancing, spending time with her family, and traveling.